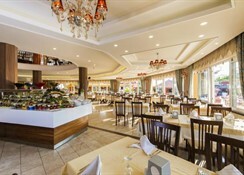 The 4-star hotel is in Konakli in the Alanya area. It was constructed in 1999 and last renovated in 2008. Situated amidst the historical sites the Castle of Antalya, spread over 60,000 mï¿½, the resort turns dreams into reality with its natural beauty. Comprising a total of 196 rooms, the air-conditioned property welcomes guests in a lobby with 24-hour reception and check-out service. Further facilities on offer to guests include a hotel safe, currency exchange facilities, lift access, a newspaper stand, hairdressing salon, games room and TV lounge. Younger guests will enjoy the kids' club and playground. Guests may sip their favourite drink in the bar and feast on the delicious cuisine in the restaurant. 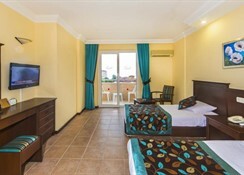 WLAN Internet access (fees may apply), a laundry service (for a fee) and a car park are also provided.